Rockman.EXE has such a great design and art style. Good times my youth had, good times indeed. Cannot wait to play this again... only this time on the BIG screen! :D I would imagine this is the 1st time the Battle Network series has been released on home console too..
Lol, as if. It doesn't matter how much money we throw at their merchandise or ancient re-releases. Mega Man is dead. Hopefully Capcom, his murderer, will be too, soon enough. Actually, there was one Battle Network game on the Gamecube. Network Transmission. 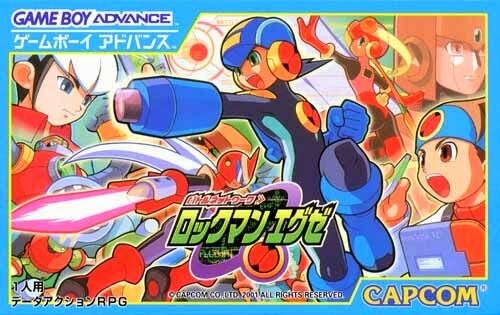 Though it was sort of an odd combination of the Classic/X and Battle Network games. Not the traditional Battle Network gameplay. How many years have fans been buying merch and re-releases to "show Capcom there's interest" in the series, or some similar sentiment? If it's going to take this long with fans having to jump through so many hoops just to get the chance of maybe possibly getting a game considered some time in the future, I'm out. Better game companies are making great games for me to waste my time on Capcom any longer. Thank goodness Sakurai actually listens to fans. Looking forward to Smash. @CATGUN: Why Metal Slug? I mean I love that series to death, but SNK is known for The King of Fighters series and other fighting games. They don't even make Metal Slug games, they mostly just publish and license them. The first 4 games were developed by Nazca Corporation, and 4th while SNK was bankrupt by Mega and Noise Factory. So yeah not exactly SNK's representative series. Pffft. Yeah right. The games were boring, repetitive and annoying. The Anime was better. I guess you don't like fun. "The games were boring, repetitive and annoying." No my friend that would be Legends. "Repetitive" is kind of in the nature of RPGs. Which a lot of people like. Clearly they aren't for you. Though the anime was decent for kids. Profit ? For what ? For their richness and their repeating to release merchandise like toy figures isn't necessarily. If they want to make a profit then make a new Megaman games. Otherwise, if they dont then they arent getting their money from us, period. It's funny how a game that centers around the digital space takes over ten years to finally be available in digital form. I wonder if Network Transmission will ever make it? Mega Man in Super Smash Bros.! When this game comes to the states, this will be my first time playing it, and on my TV screen, too! Frankly, I'm excited! From what I've seen through pictures and Let's Plays, it looks promising! The MM fanbase sometimes.... Eh whatever, anyway Battle Network is my forth favorite series after Zero, Classic and X. It is also my forth favorite RPG series after Mana, Ys and Suikoden and kinda tied with Mario RPGs (would be higher but it generally has a poor story for its type of feel to me, but great gameplay ideas), so this I will support. All my favorite RPGs that have random battles would be far better without them, BN is no exception. Just thought I'd also point that out. Anyone else wished BN would do away with random battles, and go with the encounter enemies on screen method?. Yes to MMBN remastered tracks. MM music so good. I enjoyed playing BN when I tried it. It definitely had a great world and cast that I enjoyed, but while I do like me an RPG game, it didn't really click for me, and BN2 made it harder for me to get into. Think I'll pass on this one (Even then, I don't think our Wii U can connect to the internet to access the shop anyway), but it's good to hear this. I would have only preferred a BN Collection remake, but can't always get these things. I wonder what will be different? Hopefully it all leads up to a new game but lol.